Over the last year, through outright denials or staggeringly slow responses to public records requests, refusals to discuss important decisions and misleading public statements, the district established itself as the public agency most hostile to transparency in San Diego. In school board meetings and public statements, San Diego Unified School District leaders speak often of their commitment to transparency. Last year, when the district achieved a record-setting graduation rate, Superintendent Cindy Marten said one of the top reasons for the accomplishment was the transparency it showed by sharing data on student progress with outside organizations. The district has boasted of its transparency in managing school bond money and how it reacted when lead was detected in school drinking water. But the district’s actions haven’t matched its rhetoric. Over the last year, through outright denials or staggeringly slow responses to public records requests – including some that have been found to have violated California law – refusals to discuss important decisions and misleading public statements, the district established itself as the public agency most hostile to transparency in San Diego. In April, with a $124 million budget shortfall looming, VOSD asked the district to produce communications between staff members to see what led to the shortfall. Nearly 300 days later, the district has produced nothing. VOSD asked the district for basic staffing data for the past 10 years. It took the district 207 days to produce the data. Los Angeles Unified produced the same data in 15 days. 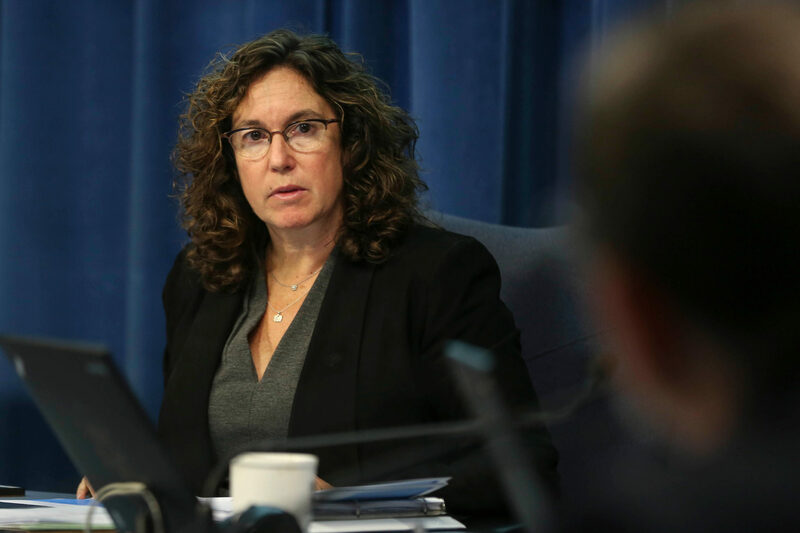 An analysis of records requested from San Diego Unified between December 2014 and October 2017 showed the district takes 80 days, on average, to deliver records requested by the public. Media outlets waited 110 days. School administrators said in a survey that they fear being reprimanded if they voice concerns. 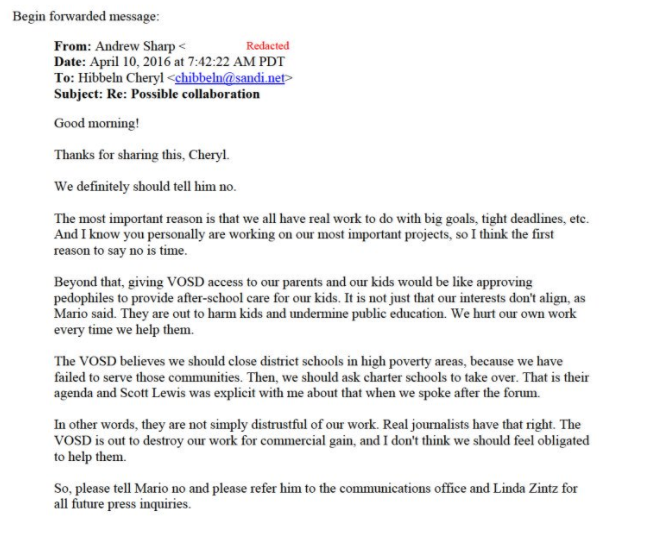 Two years ago, Voice of San Diego sent a records request to San Diego Unified seeking communications related to allegations of harassment, sexual misbehavior or inappropriate touching by La Jolla High teacher Martin Teachworth. District officials said no such records existed. But VOSD has since obtained four emails related to complaints against Teachworth that were not included in the district’s responses. The district came close to instituting a new policy in which it would purge all emails older than six months – before members of the public or the school board even had a chance to weigh in. After students who’d struggled in San Diego Unified high schools told VOSD that district counselors had suggested they transfer to charter schools, the district vehemently denied that such a thing ever took place. Later, a school district official admitted that this happened regularly, and a records request even produced official district forms in which school officials recommended charters to struggling students. Such obfuscation isn’t just a problem for reporters. It also leaves parents across the district wanting for information about their schools and children. And it costs the district money. This year, a court ruled San Diego Unified illegally withheld emails related to an investigation of former school board trustee Marne Foster. San Diego Unified must pay more than $52,000 for fees VOSD’s attorney accrued fighting for documents, with additional costs yet to be determined. To determine how long San Diego Unified takes to provide records, VOSD and NBC 7 conducted a joint analysis of records requested from San Diego Unified between December 2014 and October 2017. We found it took the district 80 days, on average, to deliver records requested by the public. Media outlets waited longer – receiving them in 110 days, on average. The district turned around records quicker for labor groups and contractors hoping to do business with the district, providing them in 37 days and 67 days, respectively. That calls into question the district’s claim that it processes records on a first come, first served basis. “Three months is not a reasonable time period to have to wait for a public document,” said Donna Frye, past president for the government transparency organization Californians Aware. While complicated records could take public agencies more time to compile, there’s no reason the district can’t provide basic documents within a week or two, Frye said. Delayed responses to requests for records – along with the fact the district’s chief public information officer Andrew Sharp twice joked about finding the body of a VOSD reporter washed ashore – was part of the reason San Diego’s Society of Professional Journalists in April awarded San Diego Unified its Wall Award, recognition for a public agency that displays an outstanding lack of transparency. “The district’s actions lead us to conclude that it doesn’t value openness and transparency,” SPJ said in a statement. At the time, Sharp blamed records delays on an understaffed legal department. He told the San Diego Union-Tribune the district was implementing changes to speed up the process. 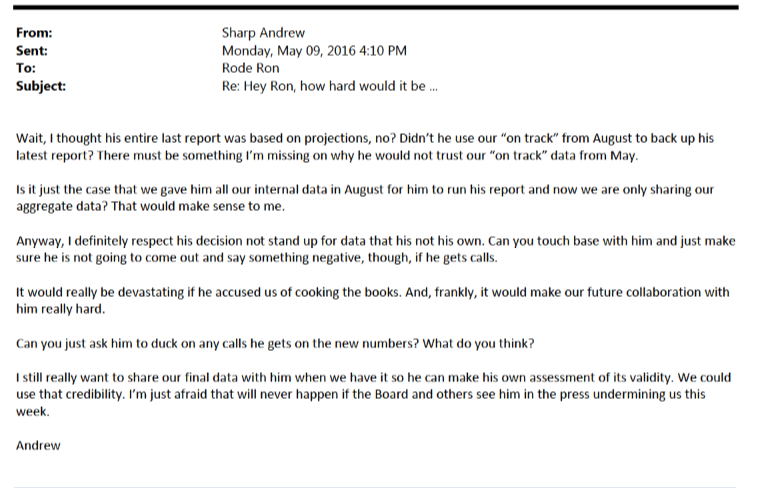 Two months later, San Diego Unified started moving forward with a plan to purge all emails older than six months – before members of the public or the school board even had a chance to weigh in – citing high costs of email retention. Only after members of the media and advocates for government transparency pushed back against the purge, arguing such a move could be illegal, did the school board recommend the district not delete emails until after one year. Frye said the problem for public agencies that don’t produce information in a timely matter often boils down to an attitude problem and lack of regard for the Public Records Act. “[Public agencies] don’t take it seriously enough, they don’t think it’s that important, they think of it as an inconvenience to them, and they oftentimes have a very negative attitude about anybody that requests information from them. So a lot of it is more of an attitude problem that sometimes is sort of institutionalized. They don’t seem to understand that the basic tenets of being able and allowed to serve the public come with that responsibility, and that is to keep the public informed about what they’re doing,” she said. A spokeswoman for San Diego Unified said in a statement that transparency is a top priority for the district. In 2016, the school district made an incredible announcement: Roughly 92 percent of students were on track to graduate – a record high for the second largest school district in the state. The UCSD research was made possible because the district had agreed to share student data with the research team, part of the San Diego Education Research Alliance. When VOSD tried to dig in to how the district accomplished such an unprecedented grad rate, however, the district declined to discuss its data in interviews. VOSD submitted requests for public records and tracked down San Diego Unified students or those who had left the district-run high schools. A picture emerged that the original numbers did not show: At least 35 percent of the students who started their freshman year in a San Diego Unified high school left district-run schools before they graduated. Many of the students least likely to graduate transferred to charter schools. If students transfer to a charter school and fail to graduate, they’re not factored into the district’s graduation rate. Some of those students said counselors had pressured them to leave, saying a charter school would be a better fit for them. Initially, the district emphatically denied that was happening: “That would be both morally wrong and financially foolish for any school to push out its students,” the district wrote on a web page created specifically to push back against VOSD’s grad rate reporting. But school board member Richard Barrera later admitted just the opposite: He said Marten discovered years ago that staff members at some schools were encouraging students to transfer to charter schools. And documents obtained through California Public Records Act requests – records the district took 11 months to provide – showed that between fall 2012 and fall 2016, school staff members recommended students find a new high school on at least 238 occasions. Some of those students transferred to in-district alternative schools. But in some cases, records show, counselors recommended students transfer to charter schools that specialize in helping students recover enough credits to graduate. Most often, school staff members recommended students transfer because they were deficient in credits. In September, UCSD researchers returned with a new report, portions of it devoted to exploring findings and allegations reported by VOSD. 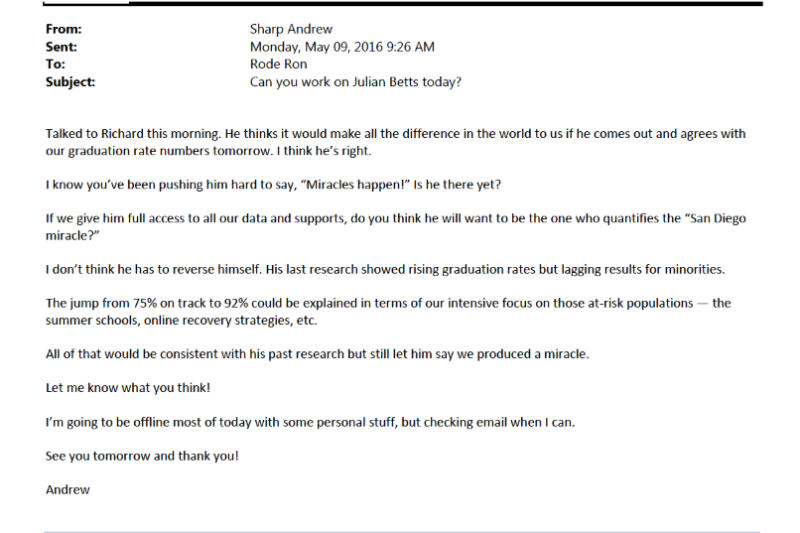 In an email, Betts said the the most charitable interpretation of Sharp’s requests was that he didn’t understand the independent nature of the district’s relationship with the UCSD researchers, or how productive and mutually beneficial the relationship had been. “Further, it seems that Mr. Sharp did not fully understand the difference between the district’s official graduation rate, the estimates of student progress used to identify struggling students as the school year progresses, and our cohort study, which followed all students in the class of 2016 from grades 9 through 12,” Betts wrote. Around the time UCSD researchers published their September report, the district enlisted PR consultant Tony Manolatos to promote its efforts to raise the graduation rate. According to the terms of his contract, the district agreed to pay Manolatos $25,000 to attend at least three meetings about the district’s graduation rate and compile information into a report to be disseminated to the public. San Diego Unified’s policy is that every piece of information that goes to media or gets disseminated to the public goes first through its press office. The district isn’t unique in this way – many public agencies set up a single point of contact to ensure information sent to the public is accurate and consistent. But records and principal survey results show those who speak to media outlets without prior approval can face hostility. In April 2016, I accepted a fellowship with New America, a D.C.-based think tank with an office in California. One purpose of the fellowship was to find new ways to engage parents and students who don’t interact with schools through traditional means. San Diego State University’s journalism school and the San Diego County Office of Education agreed to partner with VOSD for the project. I asked San Diego Unified to participate, too, but the district declined. Former spokesperson Linda Zintz said at the time parents might see the collaboration as an endorsement of VOSD. But emails revealed a different story. “Giving VOSD access to our parents and our kids would be like approving pedophiles to provide after-school care for our kids,” wrote Sharp. The hostility isn’t reserved only for reporters. Earlier this year, a survey of principals, vice principals and central office managers across the district showed, among other problems, school staff members worried they could not voice their concerns without reprimand. Liz Larkin, who retired as principal of East Village High at the end of last school year, said she was rebuked by district leaders for letting reporters into her school to document how easy online classes are for students to cheat. “Principals are scared that if they speak out, they’ll get demoted. A high school principal might get bumped down to be a vice principal at an elementary school, for example. If they don’t like you, they’ll get rid of you. This is not normal,” Larkin said in October. Earlier this month, the San Diego Press Club announced it would host an Ed Talk forum in partnership with San Diego Unified, where journalists could “ask questions and participate in on-the-record discussions” with an educator, administrator, elected official or special guest. One day before the forum was set to take place, the district abruptly canceled the event. It has not yet been rescheduled. Ashly McGlone and NBC 7 contributed to this report.